Millennials are the largest global consumer market for diamond jewelry and millennials are rapidly approaching their highest income earning years. We can’t have a discussion about the future of diamonds, without including the Millennial generation and their impact on the future of the diamond industry. Their vast numbers coupled with the fact, they are heading into their most affluent income years is positive news for the diamond industry. Globally, the top four markets for diamonds are India, US, Japan and China, which account for 73 percent of world diamond jewelry, demand. This huge market represents about 220 millenials, and estimates show a total of 22 million millennial consumers being able to afford to purchase a diamond. The overall diamond consumers among millennials, is actually growing but what distorts the number is that the share of the population is in decline relative to other age group. The truth is that despite better overall education than their parents, younger millennials, are faced with greater employment and financial challenges than the previous generation. This is delaying their path towards marriage and raising a family. This could potentially lead analysts to conclude that the millennial generation is less interested in diamonds. The truth about the millennial consumer is that their desire for diamonds is just as strong as the generation before them. They still enjoy receiving diamond jewelry and will be influential consumers of diamonds in the future. The only difference is that the millennial diamond generation is reaching financial maturity later in life. In recent years the millennial generation has spent, nearly US$25 billion annually on diamond jewelry – this is the combined figure for US, China, Japan and India. The highest concentration of millennial diamond jewelry spending was in China, where millennial spending accounted for 68 percent of total sales, followed by India at 47 percent, then the US at 41 percent and Japan at 29 percent. Millennials have huge consumer appetites for diamond jewelry and are quickly heading towards their highest income earning years. Their vast numbers and the fact, that they are heading into their affluent income years is positive news for the diamond industry. So, when you look at the data think about the future impact of the millennial generation on the diamond industry, the future is very optimistic. As millennials move towards financial maturity over the next decade, it is clear, they will become increasing more significant consumers for diamonds. 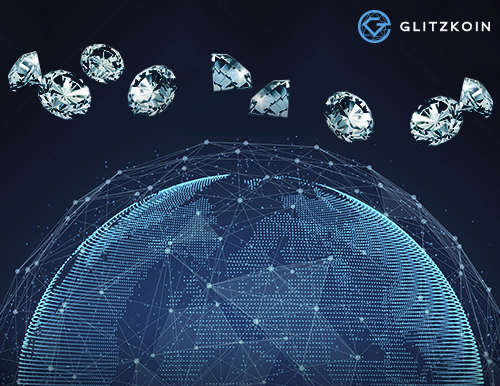 At GLITZKOIN we see a bright future for the diamond industry and strive to continue to be a leader in the future of the diamond industry. We believe that by building a diamond based trading platform based on blockchain technology, we can help to modernize the diamond industry by making it more secure and transparent. A blockchain will allow direct access between diamond sellers and buyers. GLITZKOIN led by a professional diamond team has decades of experience in all aspects of diamond trading. The finest talents in block chain technology and crypto currencies have also been inducted into the team.